Forget the food plot. 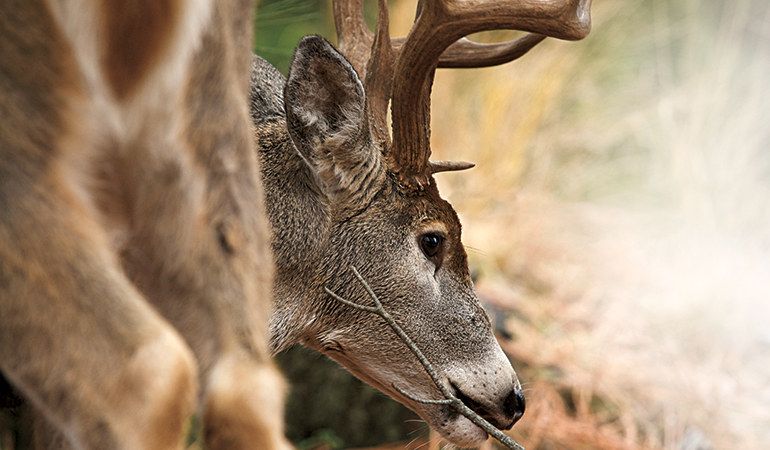 Trees are natural attractants to fuel big, rutting bucks. You know your favorite deerstand that always seems to produce? I hate to kill your buzz, but bucks don’t stroll by it because you’re wearing grandpa’s lucky cap. More likely, it’s due to a nearby oak that rains acorns like Skittles from a rainbow. Or it could be beech, hickory, persimmon, or walnut. If you know what trees deer prefer, and when, you’ll kill more bucks. This starts with knowing your trees. Fact is, a deer’s diet changes with the seasons and availability. Studies indicate spring whitetails eat forbes most of all, but these green weeds peter out by summer. That’s when they switch to browse like blackberry, brambles, greenbrier, prickly pear, poison ivy—yes, poison ivy—and dozens more depending on the region. When fall arrives, some mast trees, such as oak and persimmon, begin dropping their candy. Deer need the fat and carbs these trees provide to get them through the rut. But this candy is like ice cream; it gets eaten, spoils, and disappears fast, so when the ice cream comes around, local deer race to it. As winter rolls in, deer must rely on the late-producing mast trees. Oak is the most important tree family for deer due to its proliferation, appeal, and nutritional value. The mighty white oak, the best of them all, includes copious subspecies like post oak, blackjack, chinkapin, burr, swamp, sawtooth, and others. These spinoffs have adapted to grow in various soil types and environmental conditions. Their ranges overlap, so you’re likely to have several types of white oaks on your property. In general, white oaks are hardy, drop their acorns in fall, and are low in tannins, so their nuts taste delicious to deer. If you discover a white oak raining acorns somewhere on your property, leave your daughter’s dance recital at once and get in the woods! Red oaks also range across most of the United States. Their acorns comprise a large portion of a deer’s diet, although because they’re higher in tannins than whites, they are eaten last. Reds generally drop in late winter, even in January and February, so they provide whitetails sustenance almost into spring. Reds are also more reliable than white oaks and tend to produce acorns every year. According to biologists, white oak was not always the first hard mast choice of whitetails. That was the chestnut tree. The nut is so low in tannins and so flavorful that humans covet them. However, in the early 1900s, in what is described as this country’s most significant ecological disaster, blight was introduced from an imported Asian chestnut tree, killing an estimated 4 billion trees. Today, very few native chestnuts exist, but if you wish to have the ultimate whitetail tree on your land, a hybrid, blight-resistant variety called the Dunstan chestnut is available from Chestnut Hill Outdoors. In just five to seven years, the tree should start producing protein-rich chestnuts. Experts like Dr. James Kroll say that whitetails will walk through a mound of white oak acorns to get to chestnuts. Meanwhile, if you catch word of chestnuts dropping anywhere near your area, hail a cab at your brother’s wedding and change into your camos on the way! Beechnuts are also sought by deer. The huge, slow-growing beech tree is sensitive to drought, so it’s not often found in Texas and Arizona. Beech trees don’t start producing until around 30 years old, but once they do, the deer, squirrels, and bears come running. Pecan trees are actually a variety of hickory. They can be a decent food source but are not a deer favorite where there’s other stuff available. That’s likely because the shell itself is very bitter and deer must crunch up the whole pecan to get at the meat. Have you ever tried a pecan pie with the shells on? Didn’t think so. It might surprise you that hickory and walnut trees don’t make great deer dinner. While there are several more types of regional hard mast trees, more important are the soft mast trees. Any time you can find a tree filled with ripe crab apples, pears, cherries, or plums, you are in business. The easiest way to find these trees is to scout and identify their fruit so there’s no mistake. Kind of like a deer, you’ll know a pear when you see one. State agriculture colleges, your county ag extension office, and the Internet are great sources of localized tree info and identification, so do some research before your next scouting trip. That’s because great deer hunters are also dendrologists, for trees will provide clues to the whitetail’s whereabouts come November.